A shining star in the firmament of portable computing is the Chromebook line-up of convertibles, and ASUS has been banking on it for delivering mobile performance to contemporary audiences. 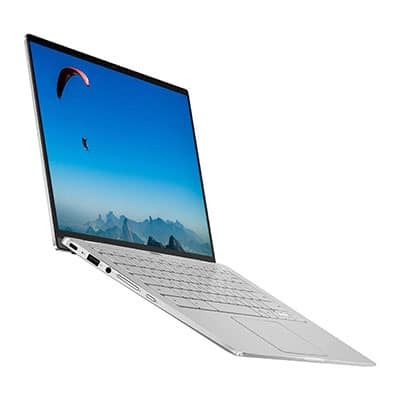 The latest ASUS Chromebook Flip C434TA-DSM4T/DS384/DS584 seems to be a competent new addition to the series, sporting a compact nano-edge bezel display, an Intel Core i7 processor, and a 360-degree hinge to expand your modes of operation. Starting at $599.00, this Chromebook promises to open up a smart world of useful applications on the Google Play Store, fuelling day-to-day life comfortably for as long as ten hours on a single charge. We assessed this most recent ASUS launch off-hand and have consolidated this review so that you know exactly what to expect. Three models have been announced until now—DSM4T, DS384 and DS584—differing essentially in their processing prowess. Perhaps the greatest victory of the new Chromebook is its stupendous processing power. It is fueled by an Intel Core i7 processor (up to 4.2GHz), 8GB RAM, and 128GB of storage—a combination that should be adequate for both routine and CPU-intensive endeavors like multimedia/wireless streaming. 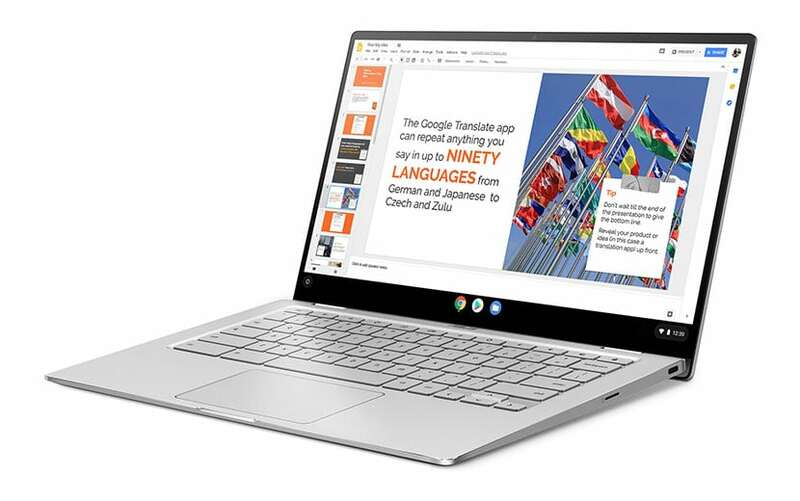 The Chrome OS, which is the operating system here, has received widespread popularity due to its user-friendly interface and high responsiveness. The battery life of ten hours, of course, is the cherry on the cake, enabling this Chromebook to slip into the shoes of a business companion or a travel buddy. Note: You can also opt for an Intel Core i5 (in the DS584 model) or an Intel Core m3 processor (in the DS384 model) if your needs (or budget) don’t warrant the might of an i7. An essential feature of an everyday convertible is flexibility of use; it must adapt to the professional and the after-hours with equal ease. The newest Chromebook offers a captivating FHD monitor with an aspect ratio of 16:9 and a narrow-bezel (0.19”) design. The four-sided bezel is thin enough to maximize the screen-to-body ratio to as much as 87%. The result is minimal distortion and compelling multimedia experiences. Notably, you also get a wide-screen view (178-degree) and a full color gamut of 100% sRGB. This ensures an accurate rendition of colors and details; it also prevents the imagery from losing crispness with changing viewing angles. Remember: This Chromebook supports Intel UHD Graphics 615 (integrated), so you might miss the scintillation of a dedicated GPU. How about the sound output? Many compact laptops end up cutting corners in the audio department, but thankfully, this Chromebook is different. It is fitted with two stereo speakers and large resonant chambers, both of which come together to produce high-fidelity audio. 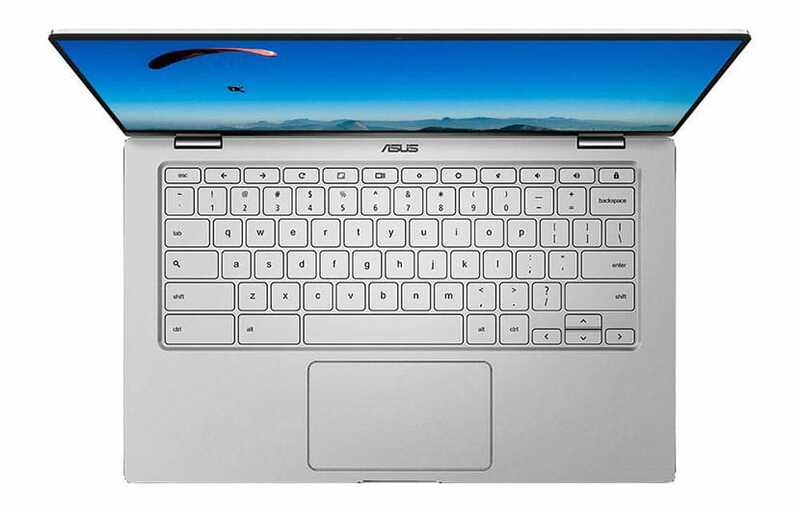 ASUS claims that this laptop is capable of delivering surround-sound effects that match those provided by larger laptops. That should be a welcome advantage for anyone who wishes to enjoy delightful A/V sessions on a convertible. Everything about the newest Chromebook reflects modern-age charm—from the all-aluminum chassis and diamond-cut edges to the sophistication in construction and the spangle-silver coloring. 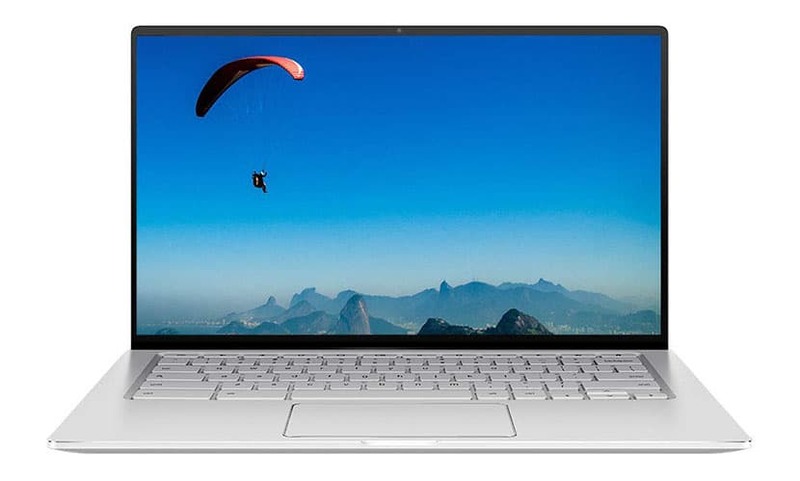 Even though it offers a 14-inch display, the chassis resembles that of 13-inch laptops, lending you a distinct edge in portability. You get more real estate without having to make compromises in mobility. 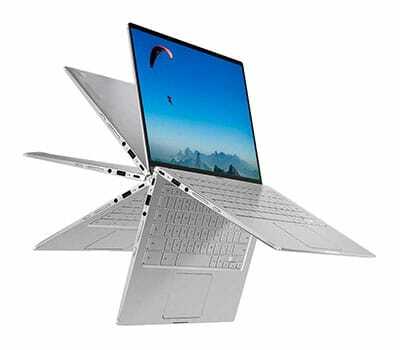 A particularly winsome feature of this laptop is its ergonomic 360-degree hinge (“ErgoLift hinge”). The main purpose of the hinge is to allow you to change the position of the keyboard according to your comfort. For instance, when you need to use the laptop from a crowded public bus, you can adjust the keyboard to a more tablet-like form, thereby upping both speed and convenience. Additionally, though, the hinge also helps to improve the auditory output of the machine. The keyboard, by the by, is already quite ergonomic, designed with backlighting and a key-travel distance of 1.4mm for effortless typing. It also features a large touchpad that has enhanced accuracy, palm-rejection, and support for multi-touch gestures. A full-purpose keyboard that understands the side effects of traveling and adapts well to them is a Godsend in convertibles—and ASUS knows this well. Further, this laptop also has a sleek profile—only 0.61 inches—and weighs just 3.19lbs. This makes it lightweight and lean enough to lug along to the office or the classroom—true to the quintessential spirit of the Chromebook. These dimensions (overall: 0.62”x12.64”x7.95”) become even more remarkable in the context of this machine’s 14-inch form factor—many of its contemporaries end up adding bulk when increasing screen space. One thing is for certain: this Chromebook will grab eyeballs, wherever you carry it. On the connectivity frontier, the latest Chromebook is well-endowed. It features two in-built USB 3.1 ports (Type-C) that come in handy to connect to devices or external displays. You can also avail of a USB 3.1 Type-A port, an HD camera, and a microSD slot. This Acer Chromebook Flip supports Bluetooth 4.0 and 802.11ac Wi-Fi (dual-band) to let users connect to the internet. The latter is a consistent Wi-Fi standard known to deliver speed (up to 867Mbps) and stability along with reduced interference. This should be beneficial for all users who rely on the World Wide Web for regular pursuits. The newly announced ASUS Chromebook Flip C434TA-DSM4T/DS384/DS584 joins an illustrious league of convertibles that offer efficient performance and engaging displays while retaining a reliable build perfect for versatile endeavors in modern lifestyles. Powered by a speedy Intel i7 processor, this laptop has the strength to support a wide spectrum of activities. It also features a display that is well-suited to various forms of content, including photo galleries and online videos. The hinge-based design complements the lightweight yet sturdy chassis, adding to the niftiness of the device. The cost-effective price point makes it an even more attractive purchase. It seems safe to predict this Chromebook’s acceptance as a strong contender for a stylish, all-purpose convertible.